2. Add the rice and fry until lightly browned. 3. Remove and grind to a fine powder. 4. Transfer to a pan and pour 1 cup of water, coconut milk, sugar, salt and pepper powder. 5. Simmer over low flame until it starts to thicken. 6. In a separate pan mix the chicken pieces and food colour water. 7. Cook until the chicken pieces turn orange. 8. Drain and keep aside. 9. Place the banana leaf on a clean surface. 10. Spoon about 1 tblsp of the rice mixture, a chicken piece, 1/2 to 1 tsp of peanuts and an egg slice on top. 11. Fold the banana leaf over the mixture to form a square packet. 12. Place this inside another banana leaf and fold the same way. 13. Secure with a twine and repeat until all ingredients are used up. 14. Pour 5 cups of water into a pot and bring to a boil. 15. Drop the packets into the boiling water and cook over high flame for 20 to 30 minutes. 16. Remove and drain excess water. 17. Cool to room temperature and serve. 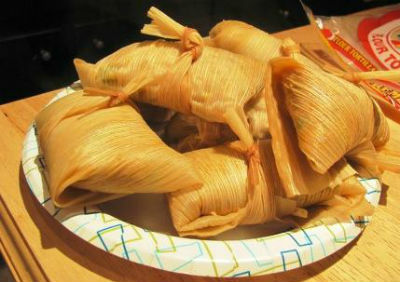 Feel free to comment or share your thoughts on this Chicken Tamales Recipe from Awesome Cuisine.